This week falls right between two major sporting events: the Super Bowl and the start of the Olympics. I made this pie for the former, but it would be just as welcome celebrating the latter. 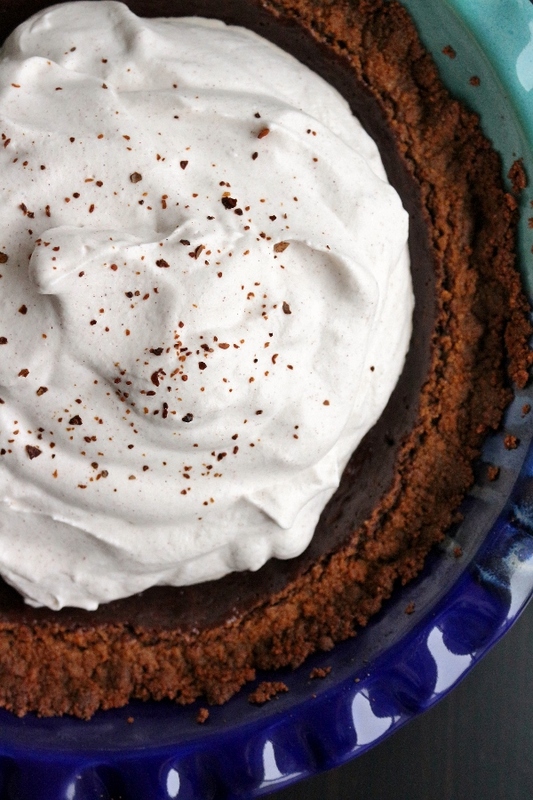 A flavorful crust made from crushed gingersnaps is the vessel to hold an equally decadent filling of chocolate ganache spiced with cayenne pepper, ground ginger, and cinnamon. It's not really spicy per se, but rather warms your throat a tad. 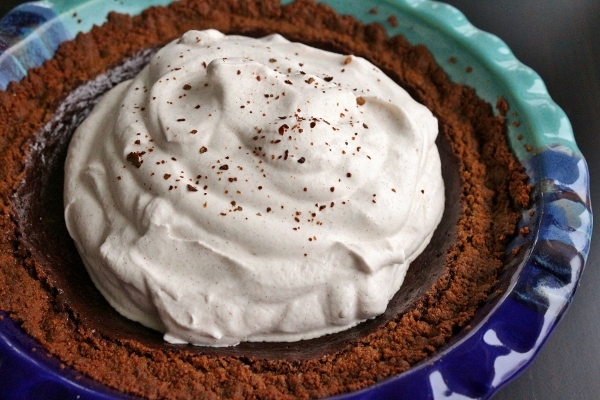 It has way more character than a typical chocolate cream pie, and is slightly richer with a more truffle-like filling than a custard/pudding one. If you're looking for a fun and festive dessert to ring in the Olympics this pie is a great choice. And while you're at it, stay tuned for posts from my upcoming Olympics party for more fun ideas for treats to make throughout the next couple weeks. Make the crust: Combine the gingersnap crumbs and butter until the butter is fully incorporated and the texture of wet sand. Firmly press the crumbs against the sides of a 9-inch pie plate, then against the bottom of the plate (the underside of a measuring cup works well for smoothing the bottom crust). Chill the crust at least 15 minutes to help prevent it from crumbling when serving. Bake the crust for 10 minutes, or until slightly darkened and fragrant. Remove it and allow to cool before filling. Leave the oven on. 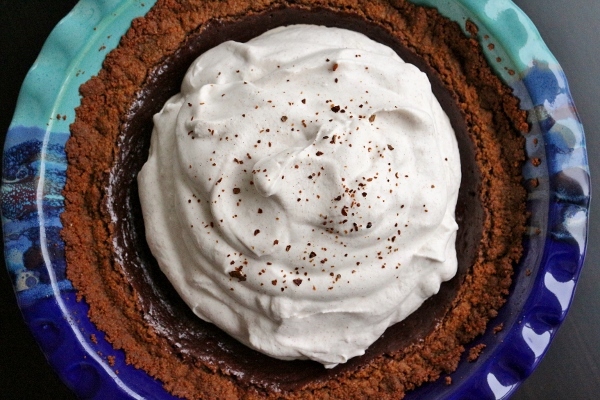 Make the filling: Put the chocolate in a heatproof bowl. In a saucepan, heat the cream over medium-high heat until it is scalded but not boiling. Pour the cream over the chocolate and let it stand for 1 minute. Whisk together the hot cream and the chocolate until they are fully blended into a glossy ganache. Whisk in the egg, cayenne, ginger, cinnamon, and salt. Put the piecrust on a baking sheet. Pour the filling into the crust and bake it for 20 to 25 minutes (mine baked an extra 10 minutes), until the filling has just set and is still slightly wobbly in the center. Remove the pie to a wire rack to cool completely, at least 1 hour. Make the topping: In a stand mixer, with a hand mixer, or by hand with a whisk, whip the cream, sugar, and cinnamon together until soft peaks form. 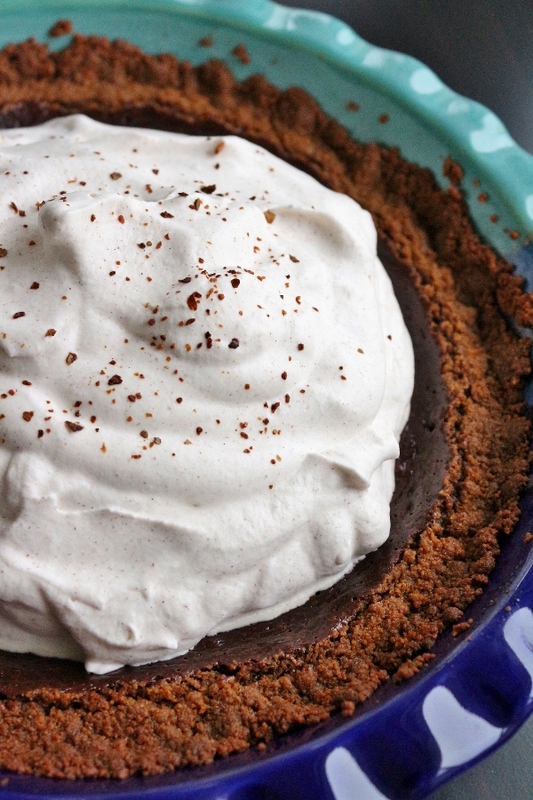 Pile the whipped cream on top of the cooled pie, sprinkle it with the pepper flakes, and serve. This pie can be made ahead, without the topping, and refrigerated for up to 1 week, covered in plastic wrap. Add the topping just before serving.